Vegetarians are regarded as being a bit strange in our culture. At par with animal lovers, crazy hippies, tree huggers, religious kooks and effeminate men. “Real” men eat hamburgers, so the macho slogan goes. Those who find the slaughter of animals barbaric are just not man enough. But moral aversion aside is it OK for 7 billion humans to eat at the top of the food chain? Now everyone knows that burning a lot of coal or oil releases tons of greenhouse gases and adversely effects our environment. 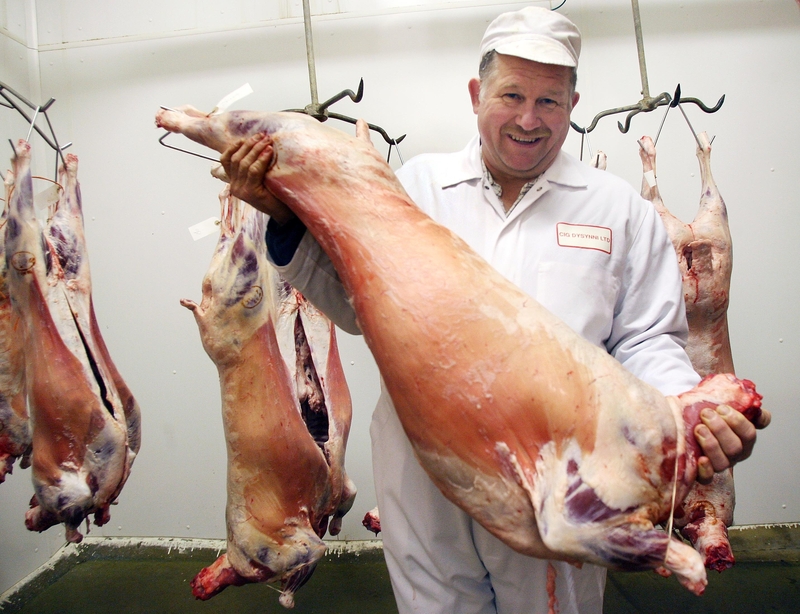 But a huge source of environmental degradation has gotten a free pass – the consumption of meat. So let’s be nerdy for a while. What are the real costs of eating meat and are they sustainable? I’m sure everyone knows that 1 Calorie from meat requires a greater input than 1 Calorie from vegetarian sources. How much and what does humankind burn in relation to the capacity of our planet? Well, here are some numbers: There are 7 billion people on earth, burning about 2000 Calories per day (each of us is like a 100 watt bulb that is on all the time). Converting to KWH per year we burn 6 trillion Kilowatt-hours of energy every year just to live and breathe. If we get all this energy from vegetarian sources we need 2 Cals of input for every Calorie we eat so we use up about 12 trillion KWH/yr. From meat and other non-veg sources the input is 20 – 30 times greater, so we would burn 25-40 trillion KWH/year if about 10% of our calories came from these sources. Compare with the total electricity production in the world last year: 17 trillion KWH. The FAO report found that current production levels of meat contribute between 14 and 22 percent of the 36 billion tons of “CO2-equivalent” greenhouse gases the world produces every year. It turns out that producing half a pound of hamburger for someone’s lunch a patty of meat the size of two decks of cards releases as much greenhouse gas into the atmosphere as driving a 3,000-pound car nearly 10 miles. With increased standards of living around the globe and rapid urbanization we expect meat consumption to triple in the next generation. 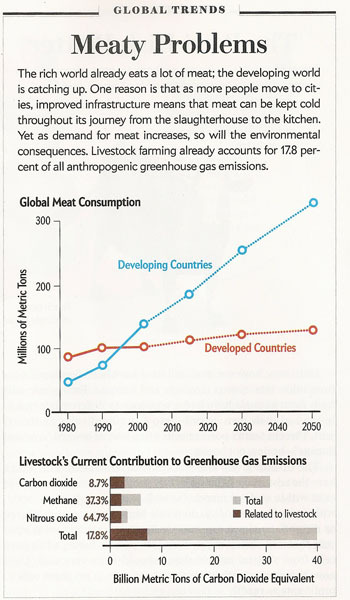 We will be consuming 300 million tons of meat per year in 2050 and will account for 40% of all human CO2 emissions! (At 18% currently). Apart from the environmental degradation this level of consumption is unsustainable from the point of view of the long term carrying capacity of the earth. There is a reason why the numbers of prey animals on our earth are substantially larger than the predator animals. It takes a very large number of prey to feed those at the top of the food chain. For example it takes a population of about 600 million seals to sustain about 20,000 polar bears. Any more polar bears and the seal population will start declining, eventually starving the polar bear population and bringing it back to equilibrium. It is also the reason that the animals at the top of the food chain – tigers, polar bears, lions etc are always endangered more than the animals at the bottom. A water crisis of catastrophic proportions is about to explode. A huge amount of water is required to produce meat. One pound of wheat has a water footprint of about 150 gallons. One pound of beef: 1500 gallons. By comparison we humans need about 15 gallons of water/month for our bodily functions. If we eat 1 lb of beef per month we are utilizing a water footprint that consumes upto 100 times the water we require to live for that month! It takes about 155 gallons of water on average to grow a pound of wheat. So the virtual water of this pound of wheat is 155 gallons. For a pound of meat, the virtual water is 5 to 10 times higher. There’s a virtual water count for everything. The virtual water footprint of a cup of coffee is 37 gallons; an apple, 19 gallons; a banana, 27; a slice of bread, 10 ….. So the bottom line is that for us humans to live at the top of the food chain is unsustainable. It is not a matter of morality, it is a matter of the survival of our planet and of us humans on it. I am not suggesting that the world should become vegetarian overnight. But a sensible earth policy must include viable vegetarian substitutes for meat. Our food industry and food policy should give us easy access to tasty protein sources packaged in palatable ways – foods made out of soya beans, quinoa, lentils, amaranth, kale and the like – with recipes that meet the requirements of the Western palate, or other tastes around the world. If we are willing to take serious action in reducing the CO2 footprint then a sustainable food policy (and a retraining of our palates) has to be an essential part of it. The fact that non-meat sources are also non-carcinogenic and good for longevity and our chemical good health (hormones, immune system etc.) will make this even more of a win-win situation. Very nice and extremely thoughtful post. The numbers are quite astonishing and you break them down in simple form so it is easy to “digest”! I also like how you approached a topic from a unique angle – that of the environment which is not as prevelant of an argument those that support vegetarianism. Especially considering the attention given to the environment today (via fossil fuels, emissions, global warming, etc. ), this shows how food impacts that equation. 3) life – most animals protect their young and their families just like humans do – why kill a living thing unnessarily? To take the contra view and balanced view, I do believe in some cases, eating meat is required. For example, if you live on an island with limited vegatation due to climate and one needs seafood or sealife to sustain life, I view that differently. I am supportive rather of reducing meat intake when possible so long as one doesn’t need it to sustain a healthy life. Great analysis. I feel exactly the way you do. Everyone is now familiar with the health and ethical reasons for vegetarianism, but very few appreciate the environmental degradation that our meat farms cause. Our food industry needs to make vegetarian products that appeal to people who have grown up eating nothing but meat, that are nutritious and healthy. Thanks for taking the time to comment so thoughtfully.